Some Fendt Tractors Operator Manuals PDF & Fault Codes list shown above. History of Fendt company is originated in 1930, when the first tractor was created Fendt brothers and their father Johann Georg in a small forge. Tractor power was only 6 hp, and as an accessory to the machine have been added hinged plow and independent of the running gear mower. Products brothers differed optimal balance of price and quality, which enabled small peasant farms to replace horse plowing on automatic. Fendt continually improved its production. Already in 1938 they released a thousandth car "Dizelross" power of 16 hp A tractor "Dizelrosss" the F22 type, equipped with two cylinders and chetyeh speed gearbox, has opened a new era in the production of tractors. During the 2nd World War came into effect a ban on the use of diesel fuel for tractors. In this regard, the company has developed a model gas generator that uses a fuel timber. The power of this machine is 25 l. from. Overcome with pride all the difficulties of the postwar period, the company under the leadership of the Fendt brothers Hermann, Xaver and Paul began to gain more and more popularity. In 1953, the company has designed a self-propelled chassis, has received great recognition from the farmers and many awards, one of which was the award DLG (German agribusiness community) for "Einmann" unique system. The development of such a system has allowed one person to fully control the whole process works. In 1961, Fendt produces 100,000 th tractor model and goes to the first position on the German market. The company has always sought to use an innovative approach to its products. Thus, in 1980 it produces Fendt Farmer 300 series with improved properties. The upgraded series had four wheels braking system increased to 40 km / h speed, and comfortable cabin has become more convenient to use thanks to the rubber bearings. 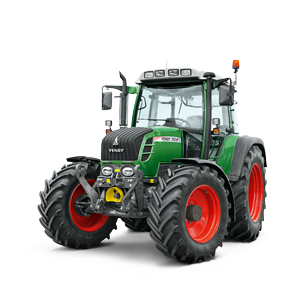 In 1997, Xaver Fendt GmbH & Co became part of the multinational corporation AGCO. In 1999, Fendt presents a complete Vario line of eleven models from 86 to 270 horsepower. 2012 was a landmark in the history of Fendt. The company launched a new series 300 Vario with SCR technology (Selective Catalytic Reduction). And also opened the most modern in the world's factory network for tractors Bäumenheim. Today Fendt every year is expanding its product range and equips cars produced new innovative solutions that allows the brand to be among the best manufacturers of agricultural machinery. Read - DEUTZ FAHR Tractor Manuals PDF & History.